Established in 1857, Carolina Beach is a friendly resort community located on Pleasure Island, the larger of two barrier islands on the Cape Fear Coast. 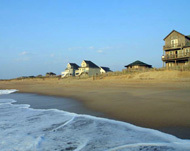 Carolina Beach residents and repeat visitors take pride in the island's nostalgic charm and wholesome family atmosphere. It represents a slice of coastal Americana with its marinas, boardwalk, pier, ferris wheel, gazebo, arcade, and specialty shops. It features an active charter boat basin, offering nightly party cruises and offshore fishing excursions. Carolina Beach has a lively central business district with a wide variety of retailers and services to meet visitor's needs. Fishing is a major activity and anglers can test their skill on piers, in the surf or on deep-sea charters. A state park invites hikers, picnickers, and campers to explore the area's vast array of coastal vegetation, including the rare, indigenous Venus Flytrap. Waterslides, miniature golf and a large amusement park delight children of all ages. Annual festivals include the Island of Lights Holiday Flotilla (lighted boat parade) and the Beach Blast Music Festival. Carolina Beach's unique retailers and clean, uncrowded beaches and warm ocean waters are sure to please everyone. A variety of comfortable accommodations range from modern family motels and cottages to luxurious oceanfront condominiums and charming bed-and-breakfast inns. Fine locally owned restaurants feature a multitude of dining pleasures including daily fresh seafood specials. All this and more make Carolina Beach a premier vacation destination.